There is so much to love about fall—and so many ways to decorate the house accordingly. Break out the scented candles, the dried corn stalks for the front porch, and the mini pumpkins for every table in the house! Keep in mind, however, that many of these decorations are tempting toys (or tasty-looking tidbits) for your favorite feline. So how should you take your pet into consideration when transforming your home into a festive autumn wonderland? The experts at The Cat Clinic at Cherry Hill can share some tips. Be cautious with candles – Who doesn’t love the soft glow and spicy scent of a seasonal candle? When you’re a cat owner, you know that a lit candle is not something you can leave unattended for long. Kitties have a habit of knocking things over when exploring tables and countertops (especially when your cat is active at night), and the last thing you want is a house fire from the pumpkin-spiced candle being pushed onto the carpet. Choose flowers with care – Chrysanthemums, though the quintessential fall flower, are actually toxic to cats and can cause vomiting, digestive problems, agitation, and breathing difficulties. Wondering which plants are safe to keep in the house? Consult this helpful list of plants toxic to cats from the ASPCA. 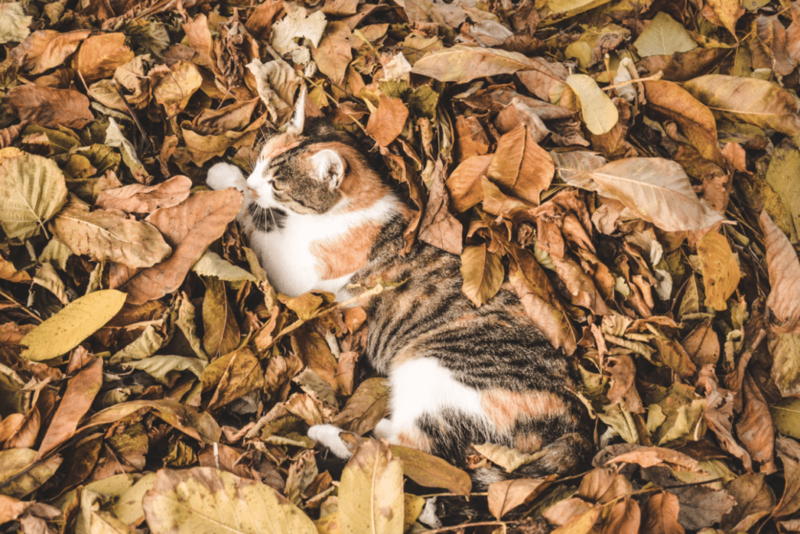 Keep candies out of reach – A colorful bowl of M&Ms or candy corn is a sweet touch for your home’s autumnal atmosphere, but it’s no secret that cats and chocolate do not mix. And while sugar in general isn’t fatal for felines, it still isn’t healthy for them to consume. You want your cat to stay fit! To keep the candy bowl inaccessible to kitties, a heavy or sealable lid should do the trick. Beware of small parts – That garland of miniature wooden pumpkins might be an adorable addition to your mantel, but it probably won’t be long until a furry paw swipes it to the ground. Examine your decorations and ask yourself, “If the cat got ahold of this, could it possibly be a choking hazard?” It might be best to reserve garlands only for rooms where pets aren’t permitted…or play it safe and skip them altogether. Those are just a few ways you can protect your cat while still adding some fall pizzazz to your home. Happy decorating! An easy way to prevent illnesses and ailments—whether they’re caused by decoration disasters or not—is to bring your cat to the vet annually for wellness checkups or other medical services. We encourage you to get in touch today to set up an appointment for your feline family member! We can be reached at (856) 662-2662. You can also come pay us a visit to check out our office in person; we are located at 35 Haddonfield Road, Cherry Hill, New Jersey. See you soon!